You must be a member of the Shanghai Lunch & Brunch Group to attend this activity. Would you like to join this group? 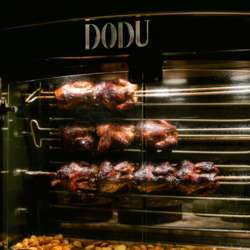 We go to new venue: Dodu Shanghai, special French brunch only for us: 1 starter, 3 main courses, 1 dessert and 1 drink. Please read carefully the rules here above all in this case that they are making a special set menu just for us. 2) This is not a date group, if your interested is this one please don't come over. The spirit of this group is to meet new friends (it doesn't matter if male, female, white, asian or black) so it doesn't matter if you are sitting in a table just with girls, it can happen, it's fun in any case. Please don't come if the spirit is "I'm leaving if I'm not sitting in a table with single men"
3) People that will leave the venue after coming, for no real reason (please see point 2) will be reported to Internations immediately. Sorry but it's necessary after what happened for 3 times. 4) Add me on wechat: ambra-schilliro2 if you didn't do it yet, so I can add you in the group chat we have for the brunch and lunch. 5) The pictures will be share in Internations website so if you have pictures of the day please share them here. Said so... I hope to see a lot of people coming and enjoying together in the spirit of Internations! !